Yesterday, we looked at a recipe for trading stocks (or futures) that have just broken out of their consolidation patterns. 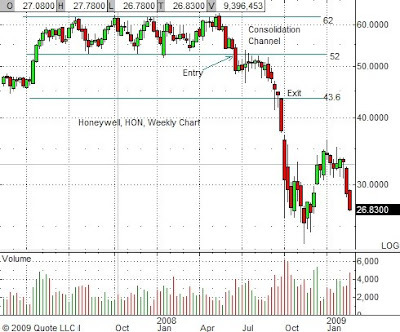 Today, we’ll look at a couple of examples of this strategy–Goldman Sachs (GS) and Honeywell (HON). 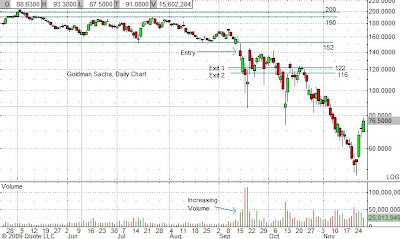 Here’s a daily chart of Goldman-Sachs (GS). The stock began consolidating in March of last year, trading between $152 and $190-$200. On September 15th, the stock ended its consolidation pattern and gapped down through support, closing the day at $135.50 on heavier than normal volume. This was the day to enter a bearish position, either by shorting the stock or buying put options. It was also the day for you to either enter a sell-stop order or set an alert for your exit point. Where is your exit? From yesterday, we saw that we can expect the stock to drop at least the same magnitude as the breadth of the consolidation ON A LOG SCALE and we gave formulas so that we can calculate it directly instead of measuring it on a chart. For Goldman, it’s pretty clear where the bottom support level is—about $152, but the upper resistance level isn’t quite as obvious. One technician might determine that $190 is the proper level thereby ignoring the data point at $200, while another technician might include it. You can choose which ever one you want, but I’d err on the conservative side and select the one at $190. Using the $190 level, our exit point will be $122; using the $200 level, the exit point is at $116. You can see from the chart that the stock had no trouble sliding by either one. Exiting according to this plan would have netted at least $13 for an ROI (return on investment) of almost 10%. Not bad for two days! Actually, it broke support the day before, closing under $52 for the first time in two years. The stock gapped down the next day which would have been your signal to enter a short position. If you had shorted near the open, you could have gotten in at $51. Your exit point for this trade would have been $43.60 (or you could have made it an even $44—this science isn’t that exact). Several weeks later, the stock finally hit the $44 mark and had you exited then, you would have netted $7 for an ROI of almost 14%. Had you instead bought the 2010 January 50 put on 6/26 at the closing price of $6.40, you could have sold it on 9/17 for $10.40. That’s a gain of $4/contract for an ROI of over 60%! You can see the power of channel breakouts, especially when the stock is moving in the same direction as the market. Of course, any monkey’s uncle in recent months could have thrown a dart at the stock market and done well shorting virtually anything out there, but most of the time the market is not nearly this volatile. You should note this because in the case of the above two stocks, had you held at least a portion of your position past the exit point, you could have profited even further. This certainly would have been true had you shorted the stocks, but be aware that because of changes in implied volatility, your option positions may not have fared so well. Also be aware of the fact that the above options returns were based on the assumption that the options were liquid enough for me to buy and sell at those prices. In a real-life situation, that might not have been the case. Later this weekend or Monday, I’ll try to rustle up some stocks that are consolidating right now so that you can add them to your watch list. This table incorporates today’s additions of NCX and HIFN. It looks as if M&A activity isn’t completely dead. Yesterday, Abu Dhabi state-owned International Petroleum Investment Co (IPIC) launched a $500 million takeover of Nova Chemicals on Monday in an effort to rescue the Canadian-based plastics maker from drowning in debt. Note that Nova trades both on the Toronto exchange and on the NYSE under ticker symbol NCX. Under the proposed terms of this friendly deal, IPIC will pay NCX shareholders (US) $6 per share in cash with the caveat that at least two-thirds of the shares are tendered. 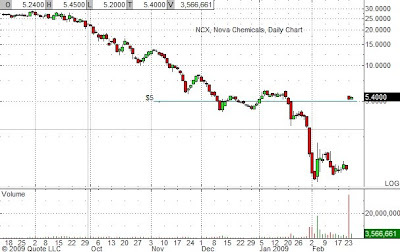 Looking at the chart of NCX yesterday (shown below), my first thought was that too many people already owned the shares at higher prices and would be loathe to part with them at a loss. But last night I looked at the chart again and noticed the substantial rise in trading volume in recent weeks. Adding up the daily volumes, I found that more shares than the float (approximately 85.6million versus a float of 82.6 million shares) had been traded since 1/21/09 when the stock price began trading under $5. The stock hit a low of a buck and change on 2/3 and has stayed below the $2 mark until yesterday when the acquisition was announced. With more than the float changing hands below $5, this was the reassurance I needed to jump in at today’s opening price of $5.20. 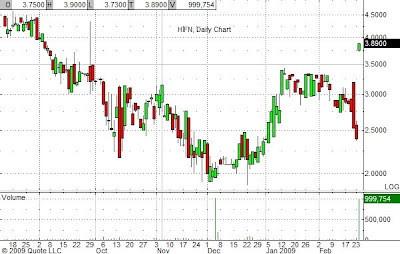 Right after my purchase of NCX, I bought shares of Hifn (NASDAQ: HIFN) for $3.80, a maker of processors used in network and data storage security. Chip maker Exar (NASDAQ: EXAR) agreed to buy all Hifn stock giving Hifn shareholders the choice to receive 0.3529 shares of Exar plus $1.60 per share in cash, or $4 a share. Based on $4/share, the deal is worth $58.9 million. It has been unanimously approved by both boards and is expected to close early in the second quarter. The MANDA portfolio table will be updated to reflect these new additions. First, my apologies for again harping on the dismal state of the market. I’m not trying to be boring; believe me, I’d much rather be reporting on something that’s a lot more interesting and useful to my readers. However, I feel it’s my fiduciary duty to impress on you how serious this downturn is and how likely it is to continue. I mentioned last Tuesday that the Dow Transports (DTX), generally considered a leading indicator, broke major support. Two days later, the Dow followed suit. It’s now trading at over a 10 year low. Since my charting service doesn’t carry Dow data any further back, I can’t even give you the next support level. The S&P 500 broke major support today, closing at 743. There’s minor support at 670; next major support is in the 470-480 range. Ugly. Looking at sector ETFs shows most either breaking major support levels and/or making new all-time lows. (Note that ETFs are relatively new inventions and most haven’t been around for more than several years.) All sectors are sucking big-time except for the metals. Gold bounced off of $1000/ounce and if it starts to trade above that, I’d be very bullish on it. As mentioned before, the pure gold play is the GLD, an ETF that holds gold bullion,* but the gold miners represented by the GDX is also doing well. (I’d wait until it tops $39 resistance before buying.) The only metal that has been outperforming gold is silver. One way to play it is to buy the SLV, the silver ETF. Two stocks that are considered market bell-weathers are Berkshire-Hathaway (BRK.A) and General Electric (GE). GE is down 85% from its $60 peak. It just broke $9 support. It’s next support level is at $7.55; below that, there’s no safety net. The Oracle of Omaha’s managed fund (aka Berkshire-Hathaway) has broken through several support levels and is sitting right on its next major support at 75,600, 45% beneath its all time high. One CNBC analyst today said that at a P/E ratio of 15 the company is still way overvalued. A P/E of 10 is more inline with his estimates. That means the stock has to drop another 33% ($25,000) to reach that value. Now that’s really ugly. One good news/bad news scenario is playing out at Cabela’s (CAB), an in-store and online retailer of outdoor wear and sporting goods. The company beat analyst expectations last Friday–the good news. The bad news is that they did it by offering fire arms at fire sale prices. One analyst thinks that this surge in sales could be a reaction to a change in gun policy by the Obama administration. That’s one explanation. Another could be that people are fearful that a possible depression could result in an increase in theft, and they are buying guns to protect themselves and their possessions. I sure hope it’s the former and not the latter explanation. Tomorrow I’ll have a “meatier” blog. Again, my apologies for another gloomy prognostication but please don’t shoot me–I’m only the hapless messenger. *According to CNBC, the GLD holds so much gold bullion that it’s now the seventh largest holder IN THE WORLD! Since my last update, two companies have completed their mergers: ANL on 2/18 and PSD on 2/6. Note that a prorated dividend of $0.04448/share was paid on PSD. Needless to say that because of the uncertain market and credit climates, M&A activity has come to a virtual halt which is the reason for the paucity of portfolio holdings. At least the fund is operating in the black, but there’s still the wild card of Dow Chemical’s acquisition of Rohm-Haas. There’s been no news from Dow as to what they’re going to do but not closing the deal is costing them $90 million a month. Dow recently slashed its dividend and cut 5,000 employees as part of their cost-cutting efforts. Are you wealthy? If so, are you tired of watching your investment returns shrink? 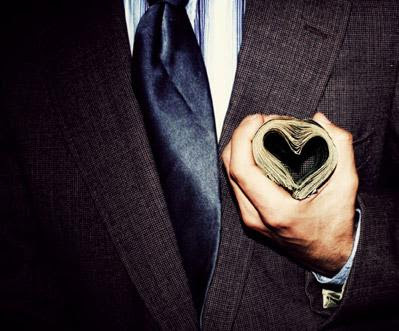 Fearful that your money manager is a crook? Worried that you’ll have to give up your private jet and a few vacation homes? Well, my friend, fret no further because now it’s possible for you to take the matter into your own hands and generate $millions$ in the market in just a short time. Sound too fantastic? Believe me, it’s not. And it’s so simple even the E*trade baby could do it! In this system, you’ll learn how Georgia-based timber baron Holland M. Ware recently pocketed a cool $7.5M and possibly more on the stock of Forestar Group (FOR), a Georgia real-estate holder and developer also involved in mineral and timber royalties. You’ll also see how Ware’s attorney, David Cook of the Jacksonville, Florida law firm of Foley & Lardner, netted $1.1M by riding his coattails. Here’s how they did it and how you can do it, too. 1. Purchase over 5% of a company’s stock at a depressed value. 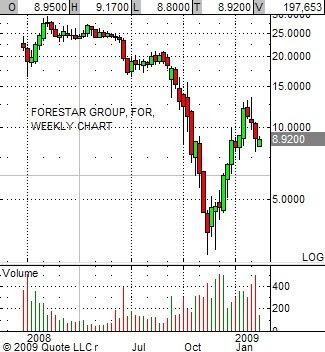 Below is a chart of Forestar. The company made its public debut at the end of 2007 near $23. A month and a half later it made an all-time high of $29.49. After that, it hung around in the high-teens to mid-20s range, but it wasn’t until late September, 2008 that it finally broke below $15. It sank like a ship’s anchor until it hit bottom in November at a price of just under $3. Ware and his attorney begin accumulating shares in the company during this time period, according to three SEC Schedule 13d filings dated 2/12/09, 1/22/09, and 12/19/08. Holland Ware: Purchases over 2.6 million shares for $14M between 11/30/08 and 1/5/09. Purchase prices range from $3.50 to $9.00; average cost/share = $5.35. David Cook: Purchases 231,500 shares for $1.5 million between 10/31/08 and 1/20/09. Purchase prices range from $3.36 to $9.00; average cost/share = $6.10. On 1/22/09, Ware makes an unsolicited offer to buy Forestar at $15 per share, much higher than the average cost of his stock but well under historical price levels. The next day Forestar stock jumps to $12, 30% over the previous day’s closing price of $9.24. 3. Start dumping your stock at inflated prices while the board considers your request. Both Ware and Cook begin selling their shares starting 2/4/09. A couple of weeks later on February 11th, the Forestar board rejects Ware’s offer because it “significantly undervalues” the company. That day, Ware unloads more than 1.2 million shares of Forestar stock. Ware’s last filing with the SEC on February 12th showed that he had sold all but 444,230 shares for a total sales price of $21.5 million leaving a net profit (so far) of $7.5 million. We don’t know if he’s sold the rest of his shares, but I can’t think of a reason why he’d want to keep them. Assuming he did sell them in the next few days at an average price of $8.90 (the middle of the price range), he’d gain another $4 million giving him a total of $11.5M yielding a nifty return of 80% in a little over two months. Looks like he can afford to keep that jet. As for his lawyer, the same SEC document shows that Cook had disposed of all of his shares for a total of $2.6 million. This leaves him with a gain of $1.1 million for a return of over 70%. Sure beats trying cases for a living! Be aware that the SEC could view this as stock manipulation, but the onus of proof is on their side, not yours. It helps that Forestar has significant timber holdings which Ware could use as the main argument for his acquisition offer. It’s also interesting to note that on the very same day that the Forestar board denied Ware’s offer, they also announced their commitment to increasing shareholder value by doing a share buy-back, slashing debt, and selling some 175,000 acres of timberland. Interesting, no? Maybe Ware can use the proceeds of his Forestar stock transactions to buy this acreage at firesale prices. Could that have been his intent all along..? Can we tempt you further? Okay, if you’re still not convinced to buy this product we’ll throw in the names of some top-notch white collar criminal defense attorneys just in the event something goes wrong. But nothing should. This is a time-tested formula used by Ivan Boesky and many others, so why not give it a try? You have nothing to lose but your reputation as being ethical but when was that ever a criterion for making money on Wall Street? A quick note on the state of the market. As we saw in my January 26 blog, the market at that time was at a critical juncture with the major indices testing major support levels. Well, folks, today we’re right back down there and unless there’s a significant turnaround in the last hour of trading, we could be looking at a complete market meltdown. Generally lauded by technicians as a leading market indicator, the Dow Transports, the DTX, has broken major support at 290. The VIX, the volatility index, gapped up over 12% today–also a bearish sign. The XLF (the financial SPDR) and the RKH (the Regional Banks Holdr) are both testing their all-time lows. Apparently, the fact that Japan, the world’s second largest economy (still? ), suffered the worst quarterly decline in 35 years along with the Empire State Manufacturing Index coming in at its all-time low didn’t help the already sour mood on the Street where most folks believe the stimulus package will do anything but. So, what should we do besides wring our hands? My recommendation is to move your longs into cash, if you haven’t done so already. For the time being, cash is king. Gold is also looking very attractive and the gold ETFs have been stellar performers over the past couple of months. The most heavily traded pure gold bullion ETF is the GLD but the GDX which represents the gold miners is also worth a look. If you’re heavy into gold, I’d suggest a mix of both ETFs to reduce your sector risk. That’s about it for now. Just wanted to give everyone this important heads-up. This wasn’t supposed to be the topic of today’s blog but in doing research that will now appear in Monday’s edition I stumbled upon a very interesting video on Morningstar that backs up my observations made in Tuesday’s blog concerning the dangers of leveraged ETFs. If you’ve never heard of Morningstar, they’re the guys who do the mutual and ETF fund ratings. They have an excellent (and addicting) site that I don’t visit often enough but when I do, I usually spend far too much time. To continue, at the bottom of one page was a link to one of their videos (shown in two short parts) entitled “Returns at these ETFs Could Shock You.” Intrigued by the dramatic title, I watched them both, and am glad I did for they expand upon Tuesday’s blog and explain in detail about the dangers of leveraged funds—the double longs and the double shorts and employ graphics to show how that even a sideways fluctuation in the market (due to extreme volatility) can produce significant losses on both the long and short sides. In doing their research, they said these leveraged ETFs perform as stated in their prospectuses. Performances over one day mirror +2x/-2x that of the indices they track. Their recommendations were that if you can’t monitor nor afford to trade these ETFs on a daily basis, you’ll most likely not be happy with your returns. My take is to look at the historical charts and compare them their underlying indices or comparable funds. If there’s a divergence, stay away, and do make sure that the fund has a long enough track record—at least a year as well as over a period of abnormal volatility (like now). I’m thankful for this diversion because the article I had intended for today wasn’t nearly as cheery nor as easy to research as I thought. And I wouldn’t want any of my readers to be bummed out over Valentine’s Day. Here’s last year’s Valentine image sent out from Bernie Made-Off. Have a lovely one! As many of you know, I’m a contributor to SeekingAlpha, a website that is a compilation of many financial viewpoints dedicated to helping investors and traders gain insight into the financial markets. I feel especially honored to have my work included as their readers are savvy, sophisticated, and well-informed. Their ranks span the home investor to the institutional portfolio manager, analyst, and trader. In short, they’re good and they know what they’re talking about. And when they comment on my articles, I listen. I had several great comments concerning Tuesday’s blog that I feel I should address here. The first one concerns the makeup of the DUG, the double inverse oil and gas ETF. I was wrong in my assumption that the fund tracks the price of oil and gas. I tried to find the fund holdings but since neither MSN Money nor Powershares, the ETF’s fund family, listed any I erroneously assumed that it was tracking an index. This is not the case. The Dow Jones Oil & Gas Index that it tracks is made up of oil and gas producers along with oil equipment, services and distribution companies. In short, the DUG is based on equities not the commodities, and as such I was essentially comparing apples to oranges. (Well, maybe lady apples to Rome Beauties as we’re still talking about the performance of the oil and gas sector.) That was my mistake. Right now there are 131 ETFs involved in natural resources. I have ten on my oil and gas list which I must admit hasn’t been updated in a while, so I missed the DTO which is a double inverse fund that came into being last June. It’s specifically designed to track the spot price of oil* and is the correct fund to use if you’re really bearish on crude. You can see from the charts below that the DTO does indeed accurately mirror the inverse movement of the USO, the US Oil Fund. Since oil peaked on 7/11/08, the USO has lost almost 80% while the DTO has gained more than 800%! Wowie! In Tuesday’s blog we saw that market volatility is a major influence on the DUG. So, how come volatility isn’t an issue with the DTO? The difference here is that the DUG is based on an index of stocks while the DTO is based solely on the price of oil and is thus independent of the volatility that affects the equity markets. Thanks to the acumen of those who commented on my article I was able to make this important correction. On a side note, I did receive a very misogynistic comment (from a fellow alum no less!) about how MIT is letting too many women graduate, among other things. A friend of mine who is in the media said that you know you’ve finally arrived when you get flamed in print. I guess Tuesday was my coming out party. *The PowerShares DB Oil Fund (Symbol: DBO) is based on the Deutsche Bank Liquid Commodity Index – Optimum Yield Oil Excess Return™ and is managed by DB Commodity Services LLC. The Index is a rules-based index composed of futures contracts on Light Sweet Crude Oil (WTI) and is intended to reflect the performance of crude oil. Note that the DTO is not optionable. Beware the short and ultrashort ETFs! What’s the difference between a long ETF and its short counterpart? Theoretically, the price chart of one should inversely mirror that of the other, but as you can see from the charts below that is definitely not the case here. The fund peaked July 11, 2008 and has fallen more than 70% since. Wouldn’t it have been nice to have had a crystal ball so that you could have seen this coming and then done the opposite like, say, buy the ultrashort oil and gas ETF? Let’s examine this scenario and see what would have happened. Here’s a chart of the DUG, the double-short oil and gas ETF. The DUG did rise after oil began to implode. It returned more than 140% from July 11 to its peak price reached on October 10, 2008 where it formed a one-day island reversal (an evening doji star in candlesticking). No matter how you look at it, this is a bearish sign. The price turned around and fell 68% since then, but so did the USO. In fact, the USO has only fallen 60% since that date! So what gives? Shouldn’t the DUG be trading through the roof instead of scraping the basement floor right now? That’s what one would expect. To clear up this mystery I went to the Proshares website where they explained why their short and ultrashort funds don’t always perform the way they should. The first, they say, is that their funds are designed to return their stated returns on a daily basis only. Here’s their explanation: “Leveraged and short funds can be valuable tools for investors who want to manage their exposure to various markets and market segments. But investors considering these funds should understand that they’re typically designed to provide a positive or negative multiple of an index on a daily basis and not for greater periods of time. As a result, fund returns will not likely be a simple multiple (e.g., 2x, -2x) of an index’s return for time periods longer than one day.” No kidding! In fact, it’s this second reason that explains much of the discrepancy between the two charts. Let’s look at the market volatility index, the VIX. You can see that the VIX has had quite a profound influence on the behavior of the DUG—much more than even the oil and gas index that it’s supposed to track! Actually, you could almost use the DUG as a proxy for the VIX—who would have thought? There’s a couple things that I’ve learned from this exercise. The first, and most obvious, is not to blindly assume that just because a fund says that it tracks the inverse or double the inverse of an index means that over the long haul it actually will. Because of this, one should be very careful of using these instruments as hedges, especially in highly volatile markets. You learn something new every day. Class dismissed. You are currently browsing the Stock Market Cook Book blog archives for February, 2009.